Hey there, Summer Camp Enthusiasts! Every camper needs a trusty water bottle to bring along with them for a summer camp stay, right? Well, you’ll be glad to see that at Everything Summer Camp, we have a vast assortment of great water bottles and water bottle alternatives for your hydrating convenience this summer. For today’s blog post I want to tell you about the All Clear water bottle from CamelBak. This BPA Free Plastic CamelBak Water Bottle belongs at summer camp because it’s so convenient in the outdoors thanks to its resourceful design. See, when CamelBak created the All Clear, they gave it proven UV technology that effectively neutralizes any potential microbiological contaminants in your water to meet EPA standards. 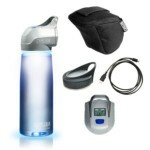 CamelBak also gave the All Clear a built-in LCD that will give you confirmation that your water has been purified. It will only take one minute! Whether you’re pouring yourself tap water, filling it with pond water, or just holding it out in a downpour , your All Clear will have it turned into safe drinking water in sixty seconds! Now you can stay hydrated when you’re out there in the wilderness! All you need is a natural water source. The CamelBak All Clear Water Bottle holds .75 L. You’ll have all the water you need when this thing is full. And when you run out, just wait until you pass another water source, and you can fill up all over again. The CamelBak All Clear lets you stay hydrated on the go and on the spot! You can also make yourself a cup of hot chocolate because the CamelBak can handle anything from ice-cold to boiling-hot water. Heavy-duty and BPA-Free, it’s easy to see—this bottle was made for camp. That’s all for today, Summer Camp Fans! Stay hydrated and drink up!